Adversity is part of everyone’s life. It can rear its head at any time, ranging from minor annoyances to overwhelming trauma and tragedy. How do we brave each new day in the face of this reality? Many of us who train in Krav Maga understand firsthand that truth can be ugly and violent, tearing at our safety, boundaries, dignity, and our very life. Others here know this is a real possibility, but have not had to survive a traumatic incident or an attack. Regardless, we all know someone who has, and violently traumatic events have touched us in one tangible way or another. We each fight adversity when and where we can; we fight back for our safety when it is threatened, and Krav Maga gives us the technique, fitness, and mindset to do this. But there’s something else we gain by being part of the Krav Maga Fitness and Self-Defense Training Center in San Francisco. We are building both our skills and our network of friends; our confidence and our support of others working to grow; our ability to fight challenges physically, and our ability to fight challenges mentally. We are becoming tougher, more courageous, fuller, and hopefully, better. 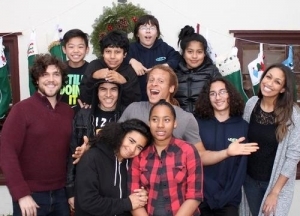 We at Krav Maga San Francisco continue to support A Home Away from Homelessness, a non-profit that helps kids and teens find housing and to build strong, confident relationships in the community. For too many young people, strong supports and skill-building are not available. A Home Away is a non-profit that does amazing work in the lives of kids and teens. They have a schoolhouse program where kids can get mentoring and help improving their grades after school. A Home Away also offers application assistance for Bay area private schools, as well as advocacy. And all this is for youth who have experienced homelessness. The Home Away kids are asked, “What’s your passion?” Mentor pairing is tailored to a client’s strengths, and a foundation is laid. We hope to see every person at Home Away continue to thrive! I am thankful to the teachers for motivating me all throughout 7th grade.